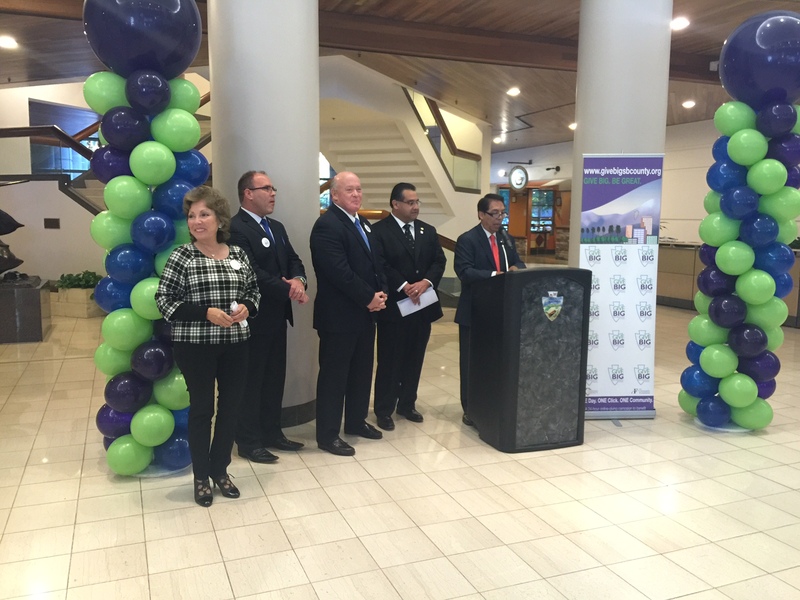 San Bernardino County Supervisors joined nonprofit and community leaders today in launching the Give Big San Bernardino County 2015 campaign. The 24-hour web-a-thon is designed to raise money for nonprofits in the county while building a culture of philanthropy and giving throughout the community. “We look forward to building on the success of last year’s Give Big campaign and generating the kind of sustainable support that will help us, as a bigger community, address some of our major challenges,” said James Ramos, Chairman of the Board of Supervisors. Creating a culture of philanthropy is a major priority in San Bernardino County and the Inland Empire, where poverty rates rank among the highest in the region. According to the Southern California Association of Governments, 19 percent of Inland Empire residents – and 26 percent of children – live below the poverty line. Compounding this challenge is a rapidly growing population. Currently home to more than 4 million people, the Inland Empire is projected to be among the fastest growing regions in the United States. More than 100 nonprofits have signed up to participate in the 2015 Give Big San Bernardino County campaign, which will begin at midnight Dec. 1 – an international Day of Giving – and continue through Dec. 2. If they prefer, donors can visit www.GiveBigSBCounty.org before then and make contributions. Thanks to funding from the Board of Supervisors and the support of sponsors, Give Big San Bernardino County is providing valuable training to nonprofits in the use of social media, cultivating relationships with donors and developing a communications plan. The 2014 Give Big San Bernardino County campaign raised more than $500,000 for participating charities. Thank you. The “4 million” is in reference to the Inland Empire, which includes both San Bernardino and Riverside counties.